What is a Nintendo Game Device? A Nintendo game system is a type of digital game system that is made by Nintendo Corporation. Nintendo game devices are known to be popular game systems for young gamers around the world. Mario, and Pokemon are some of the most popular and well-known games developed by Nintendo, in the world today. 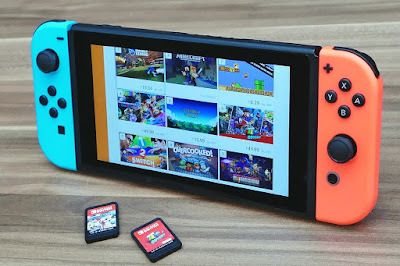 A picture of a Nintendo game device with controllers and game cards. 3DS - The 3DS is the latest hand-held game system developed by Nintendo that contains 2 screens. Wii U - The Wii U is the latest TV-or-screen-based game system developed by Nintendo that contains sensory motion input and output. Switch - The Switch is the latest hand-held, disk-based game system developed by Nintendo that can also be played on a television screen. Nintendo game devices are highly portable and can be played while transporting them from one place to another. Nintendo game devices can support touch-based and movement-based input and provide audio, video, and sensory output. TV-based Nintendo game devices are meant to be connected to an electronic device like a television set or a computer with a monitor. Nintendo game devices are known to entertain gamers for hours. Some Nintendo game devices can play movies and other multimedia disk types. The Nintendo game device provides entertainment using audio, video, and sensory modes of communication. Some types of Nintendo game devices are not practical to upgrade to. Nintendo game systems may not be compatible with other game systems. Nintendo game devices can only play Nintendo-approved game disks and cartridges. Information on Nintendo game devices can be obtained from the nearest digital electronic center in your area. Nintendo game devices are known to be among the first game devices introduced to children in some parts of the world. What have you learned about Nintendo game devices today? What is a PlayStation Game Device? The PlayStation is a digital game system developed by Sony Corporation. The PlayStation was one of the first major game systems that enabled gaming using digital disks. Since its development, the Sony PlayStation has become one of the most popular game systems in the world today. A picture of a PlayStation game device with a game controller. PlayStation 1- The PlayStation 1 is the first generation of game systems made by Sony Corporation. PlayStation 2 - The PlayStation 2 is the second generation of game systems made by Sony Corporation. PlayStation 3 - The PlayStation 3 is the third generation of game systems made by Sony Corporation. PlayStation 4 - The PlayStation 4 is the fourth generation of game systems made by Sony Corporation. PSP - The PlayStation Portable is the first generation of hand-held game systems made by Sony Corporation. PS Vita - The PlayStation Vita is the second generation of hand-held game systems made by Sony Corporation. PlayStation game devices can support touch-based button-based input and provide audio, video, and sensory output. Some PlayStation game devices are made to be portable and can be carried around and played with, while on the move. All PlayStation game devices are meant to be connected to an electronic device like a television set or a computer with a monitor. PlayStation game devices are known to entertain family and friends for hours in front of the television. The PlayStation game device provides entertainment using audio, video, and sensory modes of communication. PlayStation game devices can play movies and other multimedia disk types using the PlayStation game system. PlayStation game devices cannot play games for the PC. PlayStation game devices can only play Sony-approved game disks. PlayStation game systems may not be compatible with other game systems. Information on PlayStation game devices can be obtained from the nearest digital electronic center in your area. PlayStation game devices are well-known as enjoyable game devices to play with. What have you learned about PlayStation game devices today? What is an XBOX Game Device? The XBOX is a digital game system created by Microsoft Corporation. The XBOX can play digital games using game disks and controllers. Most XBOX game devices are connected to television sets, but can also be connected to computer screens to access the game system's features. A type of XBOX game device with a game controller. XBOX - The XBOX is the first generation of game systems made by Microsoft. XBOX 360 - The XBOX 360 is the second generation of game systems made by Microsoft. XBOX One - The XBOX One is the third generation of game systems made by Microsoft. XBOX game devices can support touch-based and movement-based input and provide audio, video, and sensory output. All XBOX game devices are meant to be connected to an electronic device like a television set or a computer with a monitor. XBOX game devices are not portable and cannot be switched on and played around with, while transporting them from one place to another. XBOX game devices are known to entertain family and friends for hours in front of the television. XBOX game devices can play movies and other multimedia disk types using the XBOX game system. The XBOX game device provides entertainment using audio, video, and sensory modes of communication. XBOX game devices can only play Microsoft-approved game disks. XBOX game devices are costly and are expensive to own at home. XBOX game systems may not be compatible with other game systems. Information on XBOX game devices can be obtained from the nearest digital electronic center in your area. XBOX game devices are known to be modern innovations in game systems today. What have you learned about XBOX game devices today? What is a Console Game? A type of game which can be played on a video game console is called a Console Game. Most console games are connected and played using a television set. Some of the most popular console games available today are the Xbox, PlayStation, and Nintendo console game systems. A picture of a console game. Storage Media - cartridges or disks are common types of storage media for console games. Aural Media - the type of sounds which appear when a console game is played consists of aural media of the console game. Visual Media - the visual elements of a console game are referred to as visual media of the console game. Play Media - the game play style of the console game is known as play media of a console game. Integrated Media - any other form of interactive media included with a console game is called integrated media. Nintendo Console Games - games released for the Nintendo series of console game platforms. Microsoft XBOX Console Games - games released for the XBOX series of console game platforms. Sony PlayStation Console Games - games released for the PlayStation series of console game platforms. Other Console Games - games released for the Sega series and other console game platforms. Console games cost less than a personal computer and can be played using a television set. Console games provide wholesome, indoor entertainment which, at times, could be enjoyed by the whole family. Console games present worlds which give players the freedom to explore and discover, making them want to discover and explore our own world - Earth in a similar way. Players cannot play the same game together using different console game platforms. A game from one console platform cannot be played on the device of another console platform. The same type of console game media might not be playable on older versions of the same game platform. Console games are a relatively inexpensive form of entertainment when compared to the personal computer. While there are some games which can be played and enjoyed by the whole family, the children would spend hours playing games instead of watching their favorite television shows. Console games are about picking a brand and going with it, or buying one of each type to get the best experience possible. What is a PC Game? A type of game which is played on a personal-use computer is called a PC Game or Personal Computer Game. PC games were one of the first digital computer games that were made for computers. These days, PC games require a huge amount of RAM and CPU computing power to play the games they make today. A picture of a PC game. Sound Effects - the sounds you hear, when you press game controls, when playing a game. Game Music - the music which plays, in the background, while you play a game. Visual Graphics - the graphical art which is displayed in the game. Game Play Mechanics - the manner in which the game wants the player to play the game. Game Story - the story which binds the game to the end of the game. PC Action Games - games which involve completing stages and jumping from platform to platform. PC Adventure Games - games which present an open environment to roam and explore. PC Role-playing Games - games which present a character or a set o characters to play the roles of. PC Simulation Games - games which simulate certain situations, hobbies, or activities. PC Strategy Games - games which require thinking and planning to play. PC Puzzle Games - games which are fun to play while solving puzzles. PC games are a wonderful way to keep children indoors and away from the television. There are some PC games which are educational and this helps parents educate their families. 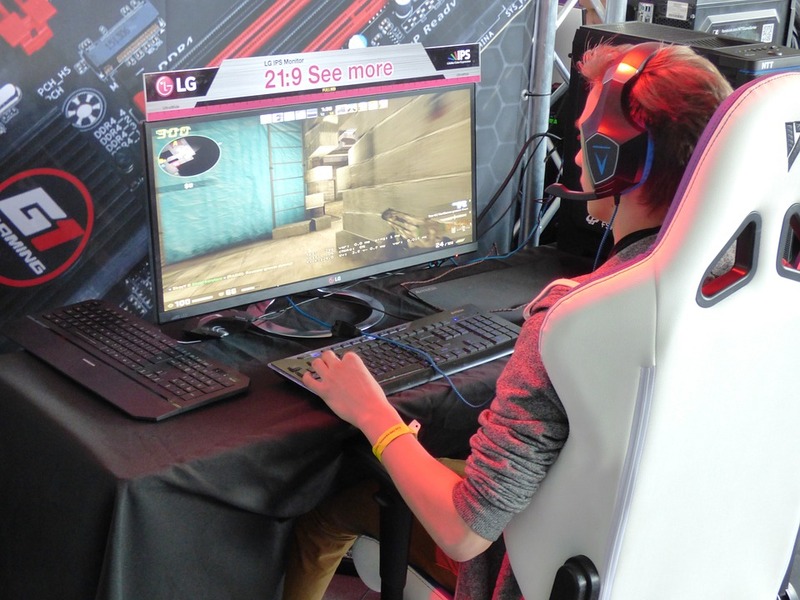 Playing PC games could increase the knowledge of a person about using a personal computer. Most PC games require costly upgrades to play PC games. 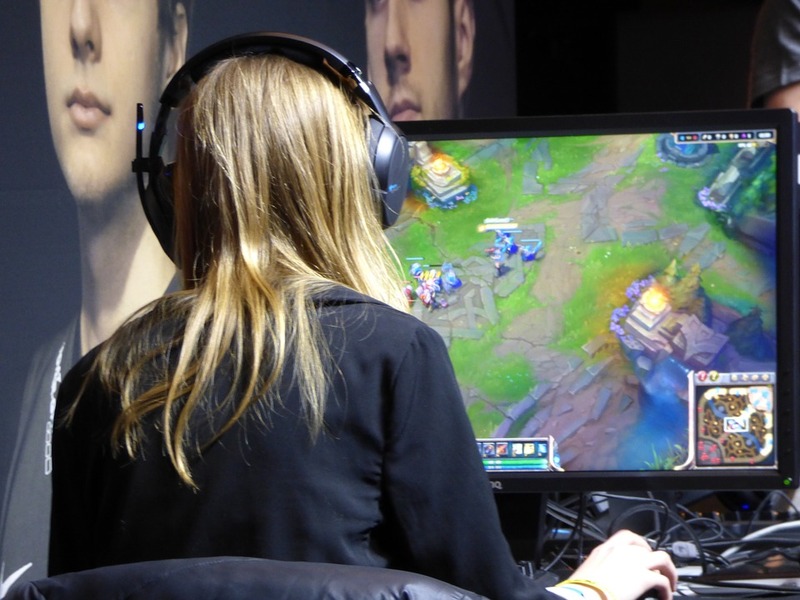 PC games can keep users occupied throughout the day and this could be bad for their health. A PC which has no data transmission media, like a USB port or disk player or Internet access, cannot be used to play PC games. PC games are readily available, for discount prices, at your nearest book store or super market. If you need a PC game, be sure to check with your nearest computer store and they might have what you need. PC games are affordable by anyone who can afford a personal computer and provide a great way to spend time to recreate competitive moments. Digital games which are played using the Internet are called Online Games. Most online games require users to become connected to the Internet to play the online game of their choice. Most of the popular online games are casual games which can be played in less than five minutes and are fun to play. A picture of an online game. Paid Online Games - Online games which can be played for a price are called paid online games. Free Online Games - Online games which can be played for free are called free online games. Online games help pass time while helping users improve their computer skills. Increased co-ordination of hand-eye collaboration and keyboard-input activity. Online games can express creativity and are pursued by many as a hobby to make games that people play. Most online games cannot be played without an Internet connection. 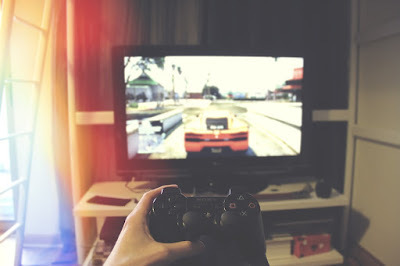 Online games can easily distract users from their computer-based tasks. Playing online games for long hours of time could cause stress-related injuries on the hands. While some online games are made available for a price, most online games are made available to everyone, for free. Playing online games is as much as a hobby for everyone that it has become an essential part of our everyday lives. There are online game networks on the Internet where users can play online games with their friends and family.